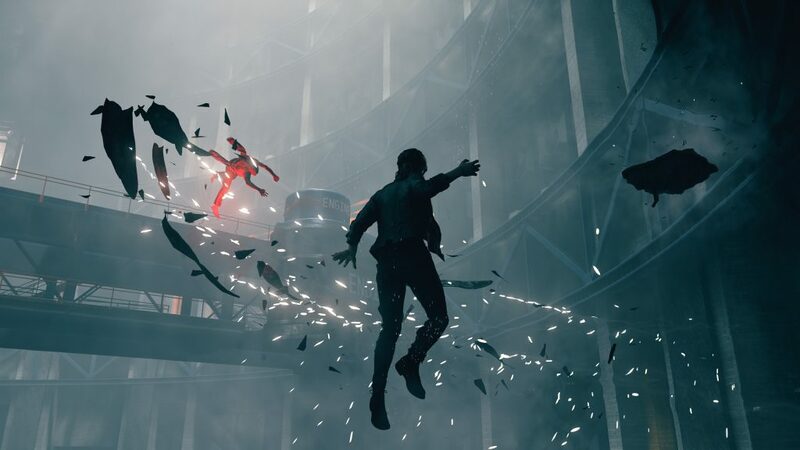 Earlier at this year’s E3, we got to see Remedy Entertainment’s next weird, strange, beautiful project, Control. Creative director Sam Lake sat down with me alongside the game’s lead actress Courtney Hope to give me some more insight on what exactly players can expect to find in the Oldest House. Jordan: Sam, what was it like for you guys getting the chance to be a part of Sony’s E3 press conference earlier this year? Is the team excited to be bringing your newest IP multiplatform this time around? I know many people may associate your studio more with Xbox as you released Quantum Break as a console-exclusive on that platform. Sam Lake: We were really happy with our partnership with Microsoft and we have been working together with them for ten years, first with Alan Wake, and then Quantum Break. But then coming off of that we just felt like we wanted a change of pace. We want to try out new things, do things differently, and take a step back looking at it like we are an indie dev, and at the end of the day the most important, exciting thing for us is to be able to make our games available to as many gamers out there as possible. So multiplatform. First, it was, you know, finding a publisher. With 505 Games, we started talking and they totally got what we were after so it felt like a really good match. Then when we decided that we wanted to reveal this game at E3, luckily we have a good relationship with Sony and we started talking with them. We’re honored that they wanted us to be a part of their keynote. That just felt so fitting, we wanted this to be something new, a change of pace for us, and you know make the statement that this is multiplatform. It just felt very clear coming out with Sony, that is the case. It all worked out really nicely and it was great fun. With so many things revealed already, leaking out kind of left and right prior to E3, somehow we managed to keep Control a secret. J: Can you guys tell me a little bit about what you’ll be talking about at this year’s New York Comic Con? SL: Here, it’s kind of all about the cast, the characters, and the story. 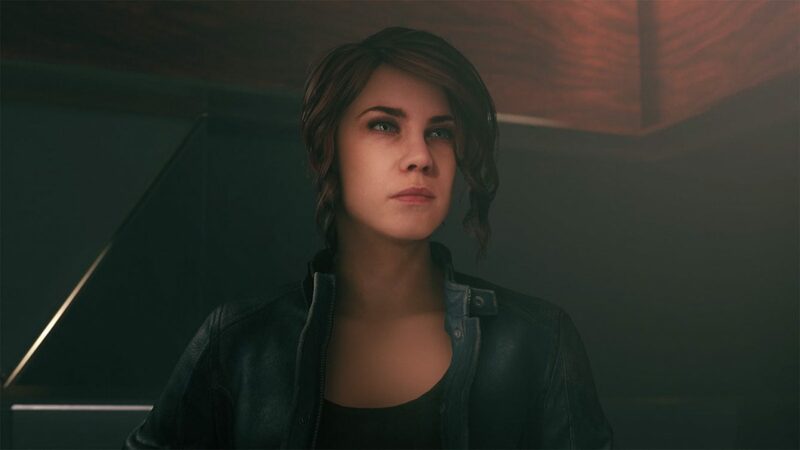 The exciting thing here is that it’s a Remedy all-stars cast.We have Courtney as Jesse our hero, and obviously worked with Courtney on Quantum Break, she was Beth. We’re really happy with her and she’s really talented. Beth was a very popular character. But that’s not all, we have other key characters in it. We have our previous director of the Federal Bureau of Control, Trench, and he is played by James McCaffrey, who is the voice of Max Payne. To me the process was like, we have this secretive government agency, and you know we want this hard-boiled, cynical, older guy, as the director of this place. Then we started thinking: well maybe as a younger man he was a cop, or a fed, and this hard-boiled man of action who must now be pushed up the ladder to be the director. Who would be perfect for a role like that? Well yeah, James was a natural fit for that. You know, over a year ago I was here in New York at Tribeca Film Festival talking about stories in games, and met James and said to him, you know, I might have a role for you. He was like, yeah, let’s do it. The final piece for tonight’s panel is Matthew Baretta, who is the voice of Alan Wake. Matt is playing the head of research, the main scientist of the bureau, Dr. Casper Darling. Who more than anything looks into these unexplainable phenomena that the bureau deals with and is trying actively to push the known reality further. So yeah, it’s bringing all of these really talented people together. Jordan: Courtney, when did you find out what Control was? What was the casting process like? I’m sure it was comfortable considering you’ve worked on Quantum Break with this team before. But when did you realize what Control really was? Courtney Hope: Well, Sam called me. I guess he was in Barcelona. SL: Yeah, I was doing Game Lab. Schedules are always crazy, and that was the first time I’d really got an okay. I called Courtney and didn’t get really far into explaining the whole thing. CH: He said, I have this idea for a new game, and I wanted to know… I kinda knew where it was going, I was like, yeah! He didn’t finish telling me what it was about, I was like whatever. I know the caliber of the stuff they do, and I know what it was like working on Quantum Break with them, how they are as people, how they are as developers, storytellers, and I was like, yeah I’m in. From there, he gave me a briefing kind of like what Control was about, you know a lot of it was without context and to be honest with you I was so excited that he had just asked me to be the lead that some of it, I was listening, but also like oh my gosh… So it wasn’t until the first time I went to Finland, to Remedy, this time for this game, that I actually sat down and they gave me a whole package, I got to go through exactly what Control was about and who Jesse was. Jordan: On that note, can you tell me anything players might not already know about Jesse? What kind of character is she? We don’t really know much yet? CH: Or just the right timing. CH: She’s been drawn here, for reasons we shall see, and so she walks in and finds this body. Jesse is very street smart. She’s been through a lot. Because of this event that occurred when she was younger, she has a very skewed perspective on reality because her reality has been different from the average human being. A lot of people thought that she was crazy growing up, the weird one. She never felt like she fit in, so I feel like this is the first time that she steps into something where she feels as though she belongs or feels like she can make a difference. So she finds this body and there are these altered objects of power that represent altered world events, kind of. They… and I’m sure Sam will get more into that, and this is the service weapon, and long story short, she grabs it for her own self-defense. Jordan: And is that the weapon we see her using in the trailer? CH: Yes. That is almost like Thor’s Hammer, and you have to become worthy of it. She has to go through these rules and rituals to be able to pass the test if you will. Because of that she passes and becomes the new director after she finds the body of Trench, the old director. Jordan: Maybe I’m just putting pieces together here, so is choosing the director more or less not a job application but a test? SL: It is a test. Without giving away too much there is this concept of this being a modern take of mythological things like King Arthur’s Sword or as Courtney said Thor’s Hammer, in a way. This particular object of power has been with the Bureau for a long time. Through a mysterious process, it has become this symbol of director-hood. So, you know, it’s almost like whatever forces are behind this gun are the ones that choose who is the director. 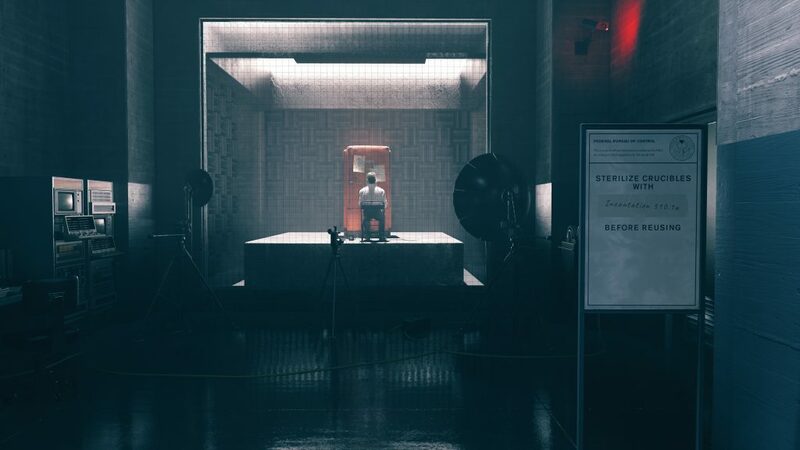 Then you need to go through this very trippy, otherworldly trial. If you’re deemed worthy to be the director, you become the director. Obviously, at this stage, really early in the game, Jesse doesn’t know what this means. She doesn’t really even understand that she’s now the director. The player doesn’t know what it means as well, but it comes with certain responsibilities and with a lot of supernatural power as well. SL: Weird is good! Control IS weird. Jordan: Awesome, so (Courtney) when you said you were given a package of information. I’m going more off of games like Death Stranding because you guys are creating something that’s sort of Sci-fi horror-esque. Were there any scenes you were recording, in which you did not know what was going on either. Did you guys reveal things to Courtney as they went? CH: We’re still in the midst of filming it, but there are so many different elements to it that there were definitely moments where I’d sit down as far in advance as I could and would delve into different aspects of what they gave me. Whether it was the lines, the character itself… there were definitely moments where I got into the booth, and they were like oh, by the way, this is bad. Just because there are so many different elements, and in the midst, it’s all ever changing and evolving. Yeah. I’m sure there will be plenty more of those moments. The team did a really great job of explaining everything to me and I was trying to be the best sponge I could be. Then bring to life what I could. SL: It’s part of a requirement almost, that there are many fragmented and pieces that we kind of know how they click together. They fit into a cohesive whole but at the same time, we want a world that is full of mystery and a lot of things for the player to interpret and piece together and discover. There are a lot of questions to chase after. We’re trying hard to create this long-lasting experience, and just creating a deeper sandbox experience for action gameplay with upgrades and unlocks. It ends up being that there are a lot of different elements that are required. Coming up with the lore, the fiction, which ends up being weird, but having fun with that as well so that we have enough material to go on. Jordan: You said that you’re still filming, but were there any really tough, or very emotional scenes… I don’t know how emotional things will get. SL: Some of those scenes are definitely coming up. CH: There were just a couple of things at the beginning where the first couple of times I went to experiment, going into the past and looking into the future. But I know there will be a lot more because there are so many different layers to Jesse. There hasn’t been anything that was truly difficult. The challenge was knowing I have all the pieces together so I can really be as authentic in each of the moments that I have presented to me. There are things that are developing, and the script is still in the midst of being written. SL: There are things being added. CH: Nothing thus far has been truly challenging, just everything has been exciting. I love it, I love being involved in it. Jordan: Sam, would you say this game is the culmination of everything your team has put together? You know, we see a lot of Remedy games with slow motion and superpowers. 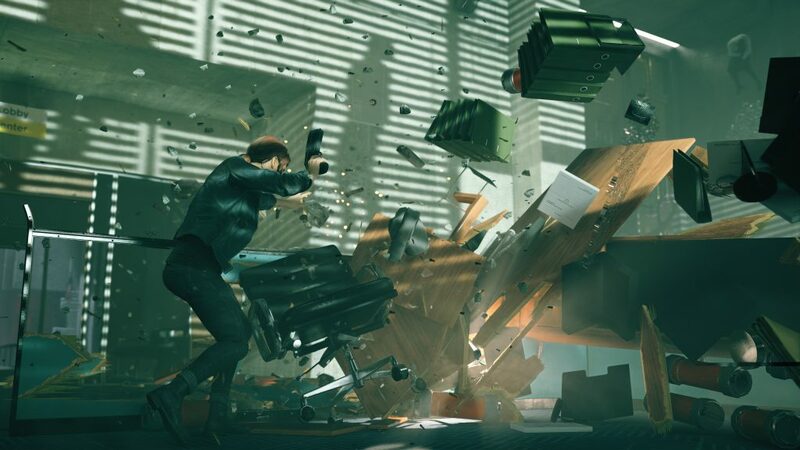 Would you say this kind of is the product of Max Payne, Quantum Break, things like that? SL: Well I think that it’s natural to say that about each game. We are trying, obviously, to learn from previous experiences. At the same time, we always want to take a step back before going into a new game. 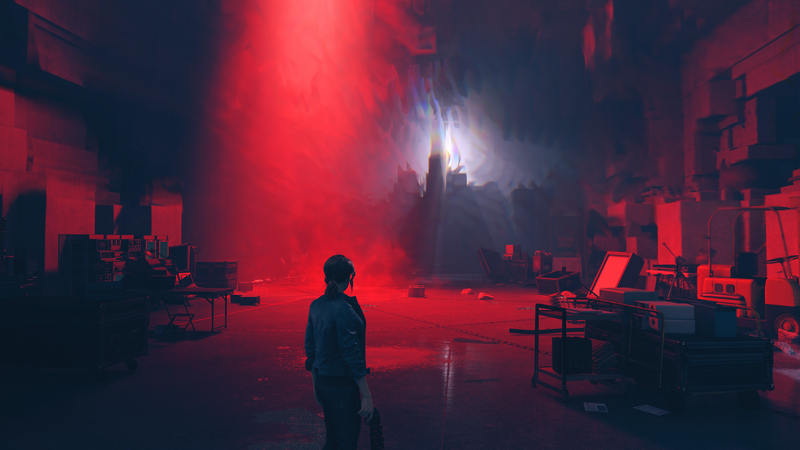 Taking a hard look at what is a Remedy game, what are the ingredients we want for this one, What are the things that work really well, what are the ones where we know that we have ideas that can be pushed further and evolve. 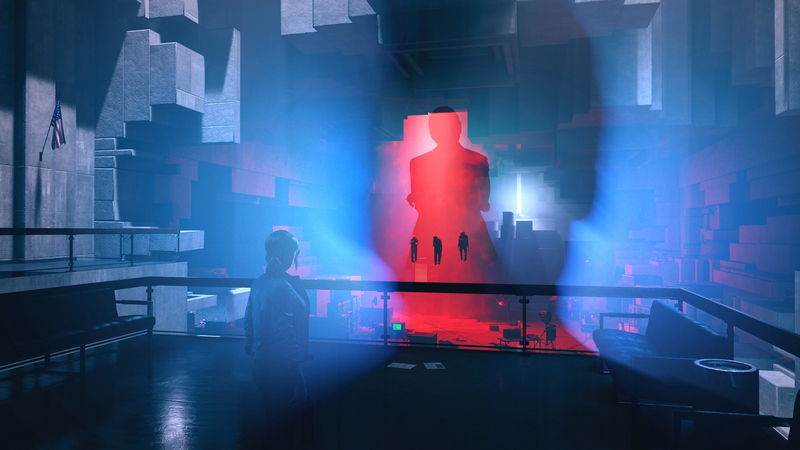 We tried out having superpowers, time-based superpowers in Quantum Break. Yes, you could say this for Max Payne. But we knew that we could take this a lot further and have a lot more fun from a gameplay perspective. That is where we went with Control. It’s not time-related. Many things are related to physics and dynamic destructibility of the environment and things like that. The storytelling side, we’ve used the inner voice or narration of the main character in our games. We do it here as well but very much set out to reinvent that whole thing. You do hear Jesse’s inner voice, almost at times her thoughts. But we have weird things going on there as well right from the get-go. It kind of feels at times like we’re breaking the fourth wall and she’s almost saying some things to you as the player. But it’s all tied to the mystery of the overall thing. Jordan: How long have you been working on Control? SL: After Quantum Break. These days Remedy is a multi-project organization. We have two game projects going on, one being Crossfire 2 story mode, which we are working together with the Korean company SmileGate. But Control is our own thing, our own IP. 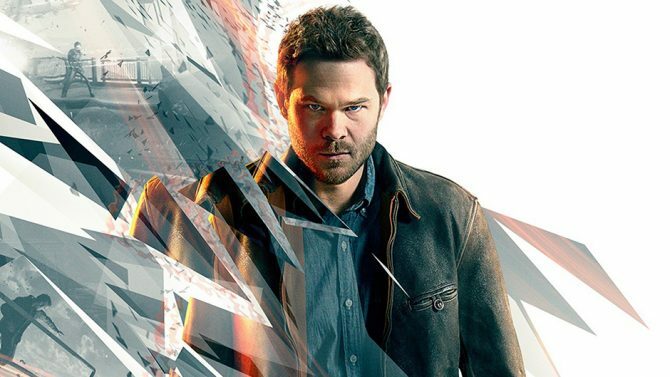 Quantum Break was a long journey, and once that was done we started thinking about what was next. 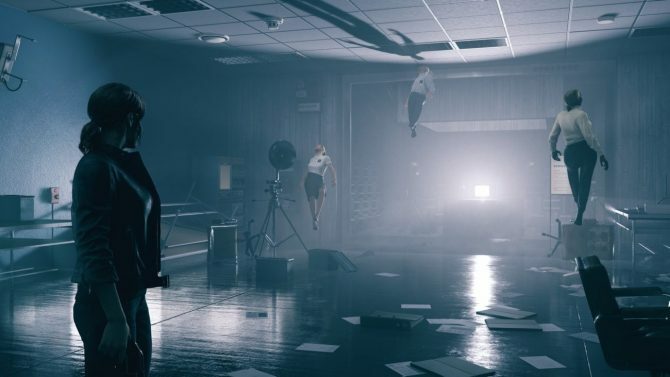 Jordan: After Quantum Break, was your team eager to work on another single player game? Some think that those games are sitting on the back burner a bit, but do you guys enjoy working on single player games more? SL: We do. As said, we create our own technology and our own tools. We are exploring. We have a lot of initiatives in different places. Certainly, in some ways multiplayer gives you certain opportunities. We look into that as well. Yet, that’s exploration, we do many kinds of exploration. We love single player experiences. Control is a single-player experience. We love narrative games. I think looking at what’s out there, single-player experiences are doing brilliantly. Phenomenal stuff coming out like God of War, Spider-Man, and all that stuff. So no worries there, I feel. Jordan: So does Jesse just gain telekinetic powers, or is this a product of the area she’s in or from the experiences of her past? SL: When she was a child, she had this very kind of fundamental encounter with the unexpected that changed her. She has been attuned to this kind of unexplainable thing. You could say that she has had certain abilities that most of us don’t have. But they have been relatively minor things, and now she comes to this place of power. She becomes the director and then suddenly she is discovering more and more of this power in her. It’s a process tied to objects of power in the game so you need to go after these things in the world and discover it. Through that, you are unlocking new abilities. SL: The name was chosen as something they could hide behind as well. It doesn’t really tell you a lot. They’re a secretive agency, dealing with the unexplainable phenomenon and trying to look for what they call altered world events. Those are events where our everyday reality has somehow been twisted and corrupted by unknown forces. They’re trying to understand them, and they are trying to apply a scientific method to researching them, in some ways failing, in some ways maybe discovering something. Ultimately this is not the pop culture version where they would be the good guys protecting us from the aliens or dark forces. They are maybe a slightly more questionable organization, or have been at least. They’re hiding these things, researching them, and using them where they can. We have Trench and Darling, who are almost like this old boys club that has been running this bureau and clearly things have gone horribly, horribly wrong at some point. We arrive at that situation with Jesse. So in some ways, there is a theme of sins of the father. Jesse inherits this responsibility and this mess that she has nothing to do with and then we are trying to understand. A lot of mysteries are there to be discovered like what has happened, why has it happened, why is Trench dead? Darling this head scientist, who has been looking into something, he’s missing in action, where is he? Does he have the answers? Jordan: So, what is the Oldest House, is that the location of the game? SL: The Oldest House is here in Manhattan, it’s the headquarters of the Bureau. It’s this featureless skyscraper with brutalist architecture. It’s an active altered world event of its own so it’s a mystical place of power. The bureau is trying to understand this place in itself. It’s this shifting place in which, under certain conditions, the floor plans change. If you know the right rules and ritualistic steps, suddenly you can make a door appear. This can lead to a whole new area of the building. We don’t know where the Hiss have come from, but it’s in this building. Luckily, it’s contained in this building but it wants to spread, take over, and corrupt. It is taking over this building, and changing this building in bad ways. We’re dealing with all of that… Jesse’s dealing with all of that. Jordan: You’ve said that this is the most non-linear project you guys have taken on. Are there branching paths? SL: I wouldn’t necessarily call it that. As an element of storytelling, we do have a conversation wheel. Talking with the NPCs you are choosing topics of what to talk about, but it’s not branching in that sense. Jesse’s journey is as it is, but it’s very fragmented. The world does a lot of the storytelling and you are discovering these fragments of the story as you explore the world and chase these mysteries. Then you are interpreting and piecing it together as you go. Jordan: How heavy are the horror elements? SL: Well it is a mature title, but I don’t think for us it ever is like horror for horror’s sake or blood and gore for its own sake. It’s always serving a… I would say that the atmosphere can be very disturbing but it’s not like violence for its own sake. It’s always serving a purpose. Jordan: With the game set in one building, how did the team come up with the non-linear open world. Were they saying like, what’s the craziest thing we can come up with? SL: You know, a lot of really talented developers are working on the art style. The initial vision of the whole thing was me, together with our game director Mikael Kasurinen. He’s very much a vision holder for the overall game. But then on the outside, we have our dynamic duo of art directors, Yam Nibolkin who is more on the technical side for special effects and lighting, and Stuart Macdonald who is more on the architectural side. 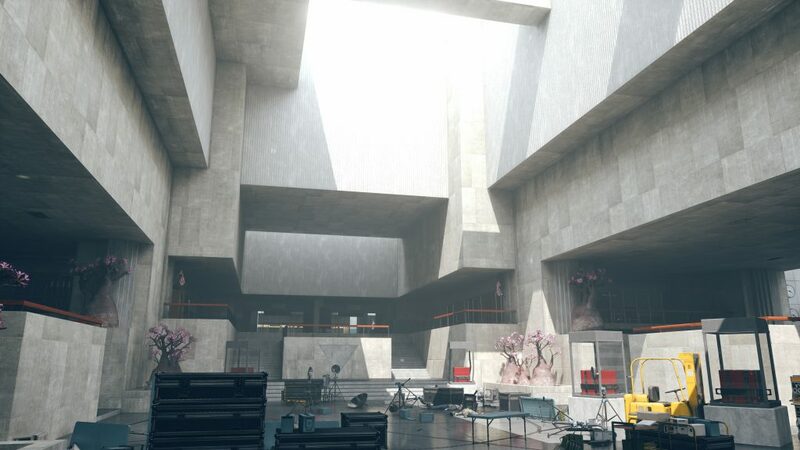 Control is a lot about contradiction and conflict in the sense that we have the brutalist architecture in the building, supernatural corrupted forces that are liquid, fluid-like, gas-like. It is a creepy hallucinatory experience. There are many things to be found in the Oldest House, and sometimes it doesn’t feel like you’re in a building. 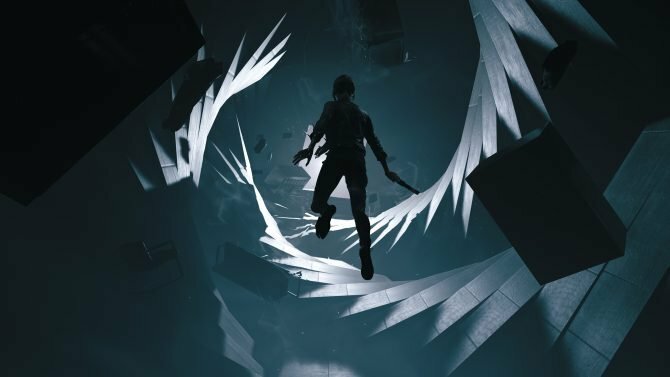 Control is set to come out sometime in 2019 for PS4, Xbox One, and PC. For more, you can check out our impressions from E3.